On a recent thread, the topic of politically correct speech as it relates to free speech came up. As with many of the more interesting threads on this blog, the topic came about from meandering rather than the subject proper of the thread. The subject was brought back to fore in my mind this morning when I read this: How Free Speech Died on Campus by Sohrab Ahmari, published on The Wall Street Journal (online.wsj.com). It seems there are a lot of misconceptions about what constitutes free speech, the limitations thereon and the consequences thereof. The core of the American free speech right and tradition is codified in the 1st Amendment of the U.S. Constitution. This has implications that apply to public discourse. Let us consider these implications. What is free speech? I think the Universal Declaration gets to the heart of the idea with the words “freedom of opinion and expression”. You are free to think what you like and express your thoughts. The marketplace of ideas – a consequence of freedom of speech – relies upon this. Everyone says what they like and may the best idea/argument win. However, that being said, there are some limitations on free speech that are universally accepted in domestic and international jurisprudence. Namely the exceptions of defamation (lying about someone for gain and/or profit) and incitement language (encouraging others to violence or panic). Many countries also recognize sedition (calling for the overthrow of government) as unacceptable as well. Consider the difference in these prohibitions and the different ways of addressing the 1st Amendment: the absolutist approach, the categorical approach and the balancing of interests approach. All three approaches allow for restrictions on free speech. The absolutist approach takes the stance that literally no law prohibiting speech is permissible . . . except when the words are so intimately tied to a specific action like inciting panic or contracting for an illegal purpose as to be inseparable from the otherwise prohibited act itself. The categorical approach attempts to define what speech is or is not protected by assigning categories such as obscenity, fighting words, commercial speech and political speech. The balancing of interests approach in every case courts should weigh the individual’s interest in free expression against a valid governmental interest in restricting the speech in question with a thumb on the scale of justice in favor of free speech. Most modern jurists adopt either the categorical or the balancing approach as the absolutist approach is impractical. Personally, I’m somewhere in between those two analytical schools: circumstances should be considered, but some speech should be categorically protected like political free speech. Defamation and incitement have sound public policy behind them. In the case of defamation, it arises from the long respected notion in torts that someone should not be able to lie about another to their detriment and/or for the defamer’s benefit. It’s a matter of equity. It has nothing to do with your feelings being hurt. There is a separate tort recognized in some jurisdictions called “Intentional Infliction of Emotional Distress”. It is a very specific, very hard to prove tort where someone says things to or about someone with specific foreknowledge and the intent to cause the hearer or subject to suffer extreme emotional distress. It is a wilful tort and you must prove the speaker had mens rea (guilty mind) in causing the extreme emotional distress. In the case of incitement, everyone knows the old trope about “yelling fire in a crowded theater”. Inciting panic or violence often ends up with innocent bystanders getting harmed either physically or by having their property destroyed and that is a matter of public safety as well as equity. Sedition, on the other hand, is a “political crime”. In the United States, a particularly odd political crime too considering the express language of the Declaration of Independence. However, with these above noted exceptions, free speech means anything goes basically. You are allowed to think and express your thoughts. This carries some broader implications. As all people are free to express their thoughts and opinions, you are certainly going to hear things you disagree with or disapprove of or maybe even find insulting or offensive. That is simply a cost of the freedom. If you value free speech then you accept that you will be disagreed with, insulted and offended at some time. If you don’t accept this fact, then you value freedom of speech as long as you approve of what others say first and that, by definition, is not free. If you cannot accept this and try to oppress others simply for having a different, insulting or offensive opinion, then you miss the point of free speech. The antidote for different ideas, just as it is for offense or insult, is more free speech. Make a rebuttal. Offer rejoinder for insult and offense. But everyone gets their say whether you personally like it or not. Respond. Don’t. It’s your choice. However, if you value freedom of speech, you’ll never try to censor. Even if the motive behind your thought is to crush an idea that is deeply offensive and indefensible. Motives don’t matter. Once you cross the line into censorship, you’ve abandoned criticism and counterargument for oppression. You will never beat a bad idea with oppression just like you’ll never stop a good idea with oppression. As the titular character V said in V for Vendetta, “Beneath this mask there is more than flesh. There is an idea, Mr. Creedy – and ideas are bulletproof.” Ideas and arguments are not idea and argument proof though. That’s the whole notion behind the marketplace of ideas. This illustrates why the antidote to bad ideas and bad arguments is precisely more free speech – better ideas, better arguments. Your feelings are not generally protected by law with the one exception in tort. They are subjective. They are your own reactions and you own them. They may or may not be rational. Suffice it to say, in an academic environment, there is nothing more detrimental to learning than shutting down the marketplace of ideas because some pinheaded “risk management” administrator thinks someone’s feelings should get hurt by words they themselves are free to challenge. If this trend continues, our colleges and universities will become a global laughing stock. Free speech must be protected at all costs. It is how we speak truth to power, to others and to ourselves when we are interested in learning truths. It can make you uncomfortable. It will challenge you. It will piss you off. It will hurt your feelings. Freedom isn’t free. It comes with costs. These are some of the costs that you pay for freedom of speech. If you don’t like getting your feelings hurt? If you don’t like being challenged? Develop thicker skin, learn to counter what you don’t like, or be ready to have yet another important freedom eroded, but this time not in the name of (false) security, but the onus of political correctness and catering to the subjective over the objective. James Madison thought freedom of speech (and the press) was critical and the 1st Amendment the most important item in the Bill of Rights. Maybe you should think about that too. Think, mind you. Not feel. That being said, have at it. Who Will Enforce the Laws Against Torture? lol . . . I missed that gem. Arguing with me is an exercise in futility in your case because you came unarmed to a battle of wits, Ariel. I hold to my arguments because they are simply better than yours. Feel free to talk about my testicles all you like though. It just shows how weak your counter argument really is. The problem in today’s society is that free speech can, and do, cost people money – both individuals and organizations. The moment you speak your mind and say something offensive you open yourself up to not only criticism and scrutiny, but financial losses from those who disapprove of your position on a particular issue. People show support for and against what and who they believe in with their money. It’s always been that way in this country and it’s becoming more prevalent every day. With the increasing use of social media for activism and the importance of branding and image at various levels, it’s more critical than ever to choose words carefully. It’s not illegal to voice an unpopular or offensive opinion, but it might hurt you financially. Your employer may decide they don’t want the added risk of having an employee that openly voices controversial opinions. If you own a business your can be boycotted. Your company name can be the target of activism. If you have a career in a field like sports, television, politics, or another field in the public eye, you risk losing endorsements and even employment. Your personal and professional image can be destroyed. It’s no longer about challenging an idea or opinion, it’s about silencing those you disagree with via the almighty dollar. Can you imagine our society ever getting to the point where activism didn’t exist the way it does now or even in the past? Where people wouldn’t boycott a fast food restaurant because of offensive comments the owner made about gay people. Where citizens wouldn’t demand a politician’s resignation because of something he/she said that was offensive to Jews, Christians, Mexicans, etc. Everyone has the right to express their opinion – the caveat is they have to be willing to live with any negative consequences that arise from doing so. The first problem is that I didn’t look up your reference, so no chronological reference for perspective, but I’ll go by my sense using Henry Miller’s works as a pivot. By his work’s, “the lewd and obscene, the profane” has pretty much been given Constitutional protection. Sexus, Nexus, Plexus, either of the Tropics can be purchased anywhere. Combine that with Hustler Magazine v. Falwell and we are done. If you look at Miller, as well Cleland and Joyce, you don’t want “including the lewd and obscene, the profane” as a proscribed speech, and the Courts have agreed. “Libelous” is problematic as it is a lie about another with intent to harm. “Fighting words” have also been dropped as well I can find, though I do think there is some justification to this “by their very utterance inflict injury or tend to incite an immediate breach of the peace.” The Courts have taken the “sticks and stones” approach. As much as I sympathize with “fighting words”, as somethings just shouldn’t be said, the “sticks and stones” approach is more adult and better for keeping the peace. Ultimately, we should give “free speech” the greatest latitude, if not all latitude. 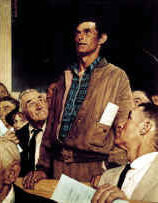 The “freedom of speech” protected by the Constitution is not absolute at all times and under all circumstances and there are narrowly limited classes of speech, the prevention and punishment of which does not raise any constitutional problem, including the lewd and obscene, the profane, the libelous, and the insulting of “fighting words” which by their very utterance inflict injury or tend to incite an immediate breach of the peace. Chaplinisky v. New Hampshire, 315 U.S. 568, 62 S.Ct. 766, 86 L.Ed. 1031. For the enjoyment of reiteration, and to leave it here for all to pass. “Enjoy your exercise in futility” is the summation of arguing with Gene H. I take joy that he admitted to it, however unwittingly. You know, one of the pleasures of discourse is recognizing when someone has so opened their mouth that a size 12 fits easily. You’re right, arguing with you is an exercise in futility. You hold to your arguments to save your testicles, as if they have ever been in jeopardy but perception can so overwhelm reality. You so make it apparent. OT this thread, but your “I feel sorry for your kids” hit a hot button. On reflection, I understand that you think when your kids hide, cowering, in a basement closet, hoping not to hear your footsteps, there’s no reason to feel sorry for them. They deserve it. So I can understand your “I feel sorry for your kids”. Have your kids quit their cowering? Have you given them reason to quit? Enjoy your exercise in futility.